Preliminary design plan for a gunboat prepared for the Navy Department during the development of the Fiscal Year 1917 program. This design was prepared to illustrate the product of the design characteristics already approved by the Navy Department and being reflected in contract plans and specifications already commenced in an effort to meet urgent construction timetables for Asheville (Gunboat # 21) of the Fiscal Year 1916 program. This plan provides three 4-inch guns, steam propulsion machinery, and a sustained speed of 12 knots in a ship 225 feet long on the water line, 40 feet 9 inches in beam, with a normal displacement of 1,575 tons. 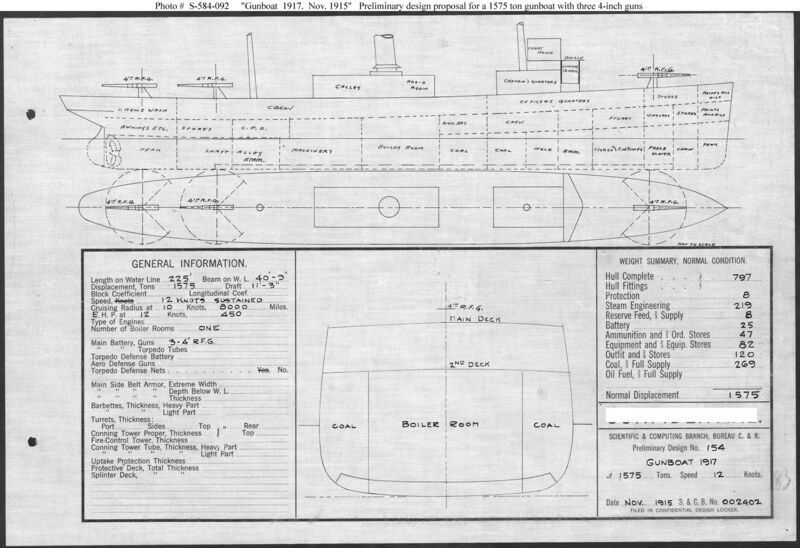 Tulsa (Gunboat # 22) of Fiscal Year 1918 also was built as an eventual product of this preliminary design work, though modified, like Asheville, in certain details.